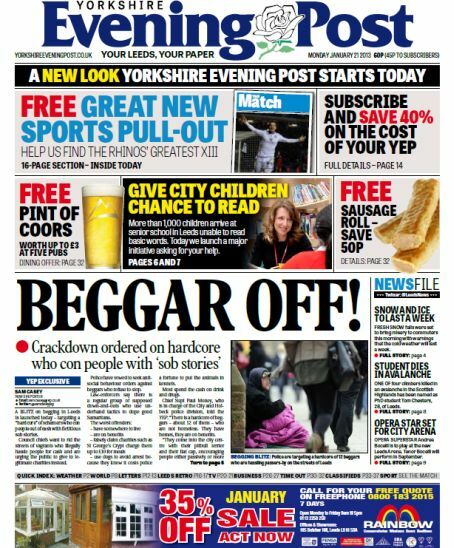 The Yorkshire Evening Post is going to be relaunched again, two years after its last relaunch. The paper got a new look and a number of new supplements in January 2013 in an effort to make it “brighter and fresher” for its readers. Since then sales of the paper’s print edition have continued to fall – they’re down 23%, from 31,200 a day in the second half of 2012 to just under 24,000 in the first half of this year. News of the latest revamp came in a job advert placed by the paper’s owners Johnston Press for a new news editor. “It is an exciting time for the Yorkshire Evening Post which will undergo a relaunch of content and design in January, and you will play a leading part in influencing that work, with a heavy reliance on a new, modern approach to our content generation, both in print and online,” the advert says. Modern approach to content generation? Johnston Press chief exec Ashley Highfield – under whose leadership the company has shed 1,300 staff in three years – is a big fan of what they call “contributed content”. In an interview a couple of months ago he spoke about the “percentage between what we write and what our readers contribute” shifting, using the example of a gardening column, written by the owner of a local garden centre, for the Harrogate Advertiser. If you fancy having a crack at the job (the news editor one, not the gardening one), you can apply here. This entry was posted in News and tagged ashley highfield, contributed content, johnston press, relaunch, yorkshire evening post. Bookmark the permalink.